Special thanks to Ken and Sue Kramer who proofread these reports week after week after week. DaJuan D. Hurst, 30, 303 Waldmann Dr., Park Forest, was arrested on November 4 and charged with theft and obstructing identification when an officer patrolling in the 100 block of Algonquin Street observed Hurst walking westbound on Algonquin Street stumbling and swaying, leaving the officer to suspect that Hurst was highly intoxicated, according to police. According to the report, the officer detected a strong smell of alcoholic beverage on Hurst’s breath. Cody C. Donlan, 19, 105 Nanti St., Park Forest, was arrested on November 5 and charged with class 4 felony possession of cannabis when police were dispatched to the 100 block of Nanti Street to investigate a report of a domestic dispute. Masekela Jennings, 41, 77 Water St., Park Forest, was arrested on November 5 and charged with domestic battery after police responded to Blackhawk School, 130 Blackhawk Street, Park Forest, in reference to a complaint of possible child abuse. Police photographed bruises on the alleged victim’s arms and legs, including one bruise on the alleged victims left upper arm which appeared to be the exact impression made from a belt. Several items including a State Farm insurance card, a driver’s license and a headphone set were reported stolen from a vehicle parked in the 400 block of Talala Street on November 7. 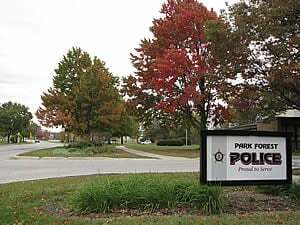 A resident told police at the Park Forest Police Department on November 7 that several unauthorized charges were attempted on a lost credit card. Police are investigating. An officer was dispatched to the 100 block of East Sycamore Drive on November 7 shortly after 9 PM when a resident reported hearing a loud crash coming from outside and witnessing someone striking a vehicle. Police have suspect information and are investigating. Police were dispatched to a residence in the 400 block of New Salem Street on November 7 at 9:39 AM when a resident returned home and found a damaged storm door screen as if someone had attempted to make entry to the residence. Police found the two window screens on one side of the residence also had been moved but the rest of the exterior was secure and entry to the house had not been made. A window of a residence in the 200 block of Kentucky Street was reported shattered on November 8. A 50-inch Emerson flat-screen television valued at $800, a plastic jar containing approximately $100 in change, a women’s gold and diamond bracelet valued at $500, a women’s gold and diamond ring valued at $1000, a black titanium Fossil watch valued at $300, and a silver steel Fossil watch with a light blue face valued at $150 are among items reported stolen from a residence in the 300 block of Somonauk Street on November 8. A bag containing papers for work and a gas card was reported stolen from a vehicle parked in the 400 block of Indianwood Boulevard on November 8. Erik A. Harris, 47, 22335 Piccadilly Ct., Richton Park, was arrested on November 8 and charged with felony DUI, DUI, DUI blood alcohol content greater than 0.08, driving with a suspended driver’s license, operation of an uninsured motor vehicle, open alcohol, and possession of cannabis when an officer was dispatched to the area of Central Park and Sauk Trail to investigate a DUI driver complaint. A juvenile told police on November 9 that while walking westbound on Lakewood Boulevard approaching Westwood Drive, he was approached by six subjects, one of whom pointed a gun at his face and stated, "Give me anything valuable." The juvenile told police he removed his iPod and handed it to the subject. At this point, the other five subjects left and all six subjects fled Northwest through the field adjacent to Forest Trail Middle School, according to police. Police are investigating. A 2012 GMC U-Haul truck, Arizona registration #AE45586, was reported stolen from the U-Haul Rental facility in the 2200 block of Western Avenue on November 9. The vehicle had been rented on October 23 and was never returned. Jessica V.R. Owens, 18, 27 W. Rocket Circle, Park Forest, was arrested on November 10 and charged with misdemeanor retail theft when police were dispatched to Walgreens, 15 S. Orchard Drive, in reference to an alleged retail theft offender in custody. Lundon P. Brazzleton, 23, 330 E. Maple Dr., Glenwood, was arrested on November 10 and issued a municipal citation charging possession of cannabis and issued traffic citations charging no rear registration plate light, illegal transportation of alcohol, and operation of an uninsured motor vehicle when an officer on patrol traveling eastbound on Sauk Trail observed that the vehicle Brazzelton was driving had no rear registration light, according to police. A white 2010 Dodge Caravan, Illinois license plate H965794, was reported stolen from the first block of Leims Road on November 10. Monica A. Dixon, 3901 Tower Dr., Apt. 410B, Richton Park, was arrested on November 10 and charged with domestic battery and criminal damage to property when police were dispatched to the 500 block of Blair Street to investigate a domestic battery complaint. Ronrecus J. Griffin, 32, 733 Sandpiper St., Apt Unit 4, University Park, was arrested on November 11 and charged with criminal damage to property when police were dispatched to the 100 block of Lester Road in reference to a report of a disturbance. The rear driver’s side window of a vehicle parked in the 300 block of Shabbona Drive was reported shattered on November 11. A man riding a bicycle eastbound on the south sidewalk of Sauk Trail on November 11 just before 1:37 AM told police that as he approached the intersection of Sauk Trail and Westwood Drive a black four door car driving eastbound on Sauk Trail approached him. As the vehicle passed him, he heard yelling which he could not distinguish, and also felt his jacket getting hit with paint balls. He looked at the vehicle and he saw a paintball gun hanging out of the window going off repeatedly. The vehicle then made a U-turn and fired again multiple times. The vehicle then left the area westbound at a high rate of speed. The man said he believed the vehicle was a Ford Focus. A 42-inch Hitachi flat-screen television valued at $500, a Toshiba laptop computer valued at $500, a 42-inch flat-screen television valued at $500, and a DVD player valued at $50 are among items reported stolen from a residence in the Sauk Court on November 11. 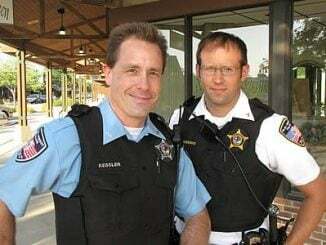 A Flip Ultra HD video camera valued at $300 and a black Apple iPhone 4S valued at $200 were reported stolen from a vehicle parked at a business in the 400 block of Sauk Trail on November 12. Hollese T. Williams, 19, 1023 Park Ave., Ford Heights, was arrested on November 12 and charged with attempted theft when police were dispatched to a business in the 400 block of Sauk Trail in reference to a counterfeit $50 bill which the suspect allegedly attempted to use to purchase food twice, both instances within minutes of each other, once from the counter and once from the drive through of the restaurant, according to police. A spare ignition key was reported stolen from a vehicle parked at a residence in the 100 block of Monee Road on November 13.